A wolf and pup show off the technique of howling at the moon. 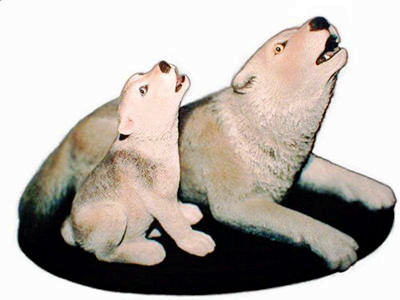 Now available as howling arctic wolves and wolf puppies. You would howl with joy to receive this fine wildlife artwork from southwestern Florida. Timber or gray wolves are intelligent and resourceful animals with a structured social order. The wolf pack consists of a breeding alpha pair, their offspring, and non-breeding adults. Around five pups are born in early spring and are cared for by the entire pack. Wolf pups are mostly grown at 7-8 months of age, may leave the pack in 1-2 years and breed in 2-3 years. These dogs are able to adapt to climate extremes with cunning and hunting skills. Reintroduction efforts seem to be successful enough to revive the inevitable conflicts for natural resources. Inaccurate information makes wolf management more difficult than many other wildlife. Large intelligent animals are just no simple solution to manage and require at least equal reasoning to understand. Wolves distinctive howl is used as communication for a hunt, to sound an alarm, locate other members of the pack, and to warn other wolves of their territory. Wolves frequently howl more early morning and in the evening.